If I’m convinced of nothing else it’s Oswald’s incredulity with respect to the charges made against him. Nobody was more flabbergasted than Oswald at all that was swirling on around him. The audio of the “experts” didn’t seem to match the facts of the footage they were showing. The footage was of a guy screaming he’s innocent and that he’s being railroaded. The audio was from a bunch of 3rd tier self appointed nobody’s 50 years later trying to convince you he’s guilty. They weren’t even there! I mean it’s a real joke in my eyes. You gotta remember Bugliosi was never anything more than an assistant da for the city of LA. law schools crap out ADAs every day. CNN plays him up like he was former mayor or something. 2) He was shocked and confused as he learned he’d been framed. 3) The frame has become history and was intended to become history. It was central to the assassination. It ensured a tidy public ending. The look on Oswald’s face when some reporter tells him that he’s going to be charged with JFK’s murderr is the classic “Oh Sh*t” look. Bugliosi was a pretty amazing prosecutor, that’s why he’s played up. He convicted like 300 of 303 cases or something. Add to that he was a successful author before writing about the assassination. He is wrong on the assassination, obviously (he drops the ball repeatedly in his book), but he still should command some respect. The vast majority of prosecutors win almost every case. That’s not to say he wasn’t good, but his record isn’t all that remarkable in relation to peers. Most criminal charges result in plea deals. Prosecutors usually only go to court when the evidence is strong. Mitch, all prosecutors, state and federal, have nearly perfect batting averages. They pad their averages heavily with plea bargains. The cases they take to court, the ones in which the defendant rejects a bargain or no bargain is offered, are overwhelmingly slam dunks, not infrequently because of corrupt police practices that don’t come to light. Prosecutors having records like Bugliosi are a dime a dozen. It was amusing to see the prepubescent Dan Rather. I read somewhere that CBS had brought an army to cover the Dallas campaign stop – I wonder if they had a tip? Good point …. Walter and Dan both made careers that day. Yes perhaps, but Walter helped end the Vietnam war….ooops…there’s that “word” again…! Re the CBS coverage that day, you have to remember this was a long planned visit, meant to be a prelude to the 1964 presidential campaign. IIRC, it was first announced this trip would be made in June or July of ’63. It was meant to be a big media event, hence the heavy on ground media presence. Cronkite was already a CBS heavyweight (anchor of their just recently expanded to 30 minutes nightly newscast) and was in NY City when the news of the assassination hit. Rather was already an up and comer due to his coverage of a hurricane in ’61 or ’62 from Houston. He was a native Texan, so only natural to have him in Dallas for that trip. Both of them toed the line afterwards to their eternal shame, but I can’t believe they were in on what was to occur. CNN— deliberately misleads the public by ignoring current forensics and trajectory analysis that prove a shot from the front. There is no such analysis and forensics. The efforts of amateurs trying to prove conspiracy don’t count. What are you invoking here? Tink’s invisible second head shot? Mantik’s “I don’t publish in peer reviewed outlets” claims about x-ray fakery? By your standards, there is no evidence Oswald was on the sixth floor and shot the rounds that fired Kennedy. Or did you prove it and I’m just not aware? You have cited this as a quote: “I don’t publish in peer reviewed outlets.” Please cite your source for this. That certainly does not sound like me. Have you published any peer reviewed articles in scientific journals where you outline your theory of x-rays alteration? If so, you can easily post citations, right? Nice that a journal let you write a response to a peer reviewed article. But you’ve been at this 20 years. What peer reviewed articles have you already published? Without knowing exactly quite what motivated you to invoke David Mantik’s name and work in a response on this particular thread, I thought that it would interest you to learn that his Letter to the Editor (a summary of the JFK medical evidence), ‘Re: Plast. Reconstr. Surg. 132: 1340, 2013 “The Assassination of John F. Kennedy: Revisiting the Medical Data’ has been accepted for publication in the January 2015 issue of that journal. While there are space limitations imposed on his letter, you may rest assured that he has maximized the opportunity extended to him. Mantik’s forthcoming summary of the JFK medical evidence will no doubt be illuminating for your Marquette students to consult, as it will be substantially more informative and edifying than the meager and inadequate coverage assigned by you in your syllabus (at http://www.marquette.edu/polisci/documents/4191SyllabusMcAdams.pdf). Indeed, sophisticated and well-briefed readers of this forum may speculate on why you steer your students away from any substantive information regarding the variety of falsifications in the medical evidence (e.g., the radiopaque occipital patch as well as the visually convincing but photometrically preposterous 6.5 mm cylindrical cross-section observed on the outer skull table), which Dr. Mantik’s scientific examinations have turned up. I feel certain that even with this publication by Mantik your citations of his work are unlikely to make their way into your syllabus. Mantik’s forthcoming summary of the JFK medical evidence will no doubt be illuminating for your Marquette students to consult, as it will be substantially more informative and edifying than the meager and inadequate coverage assigned by you in your syllabus (at http://www.marquette.edu/polisci/documents/4191SyllabusMcAdams.pdf). What you are calling “meager and inadequate” is the assessment of the HSCA Forensic Pathology Panel. I also assign my students the HSCA authentication of the autopsy photos and x-rays. I teach my students to look for the most reliable evidence. Amateurish buff stuff claiming alteration doesn’t qualify. Dr. Mantik took his graduate education in physics at Illinois, Wisconsin, and Stanford. As a physicist, he certainly learned to kick the tires before accepting a data set, and put his training to good use when evaluating the NARA autopsy material. He noticed many invalidating anomalies which escaped the attention of the FPP, not least of which is the emulsion-covered image of a scribing on an autopsy x-ray purported to be original. How do you represent this to your students, and do you know of any observers who dispute Mantik’s observations after having themselves viewed the x-rays in the National Archives? But he has no credentials at all in the forensic examination of x-rays. He’s not even a radiologist, but a radiation oncologist. The only thing he has ever published in any peer reviewed journal is a letter to the editor. Contrast this with Lattimer, who was a urologist, but published multiple articles in peer reviewed journals. And contrast Mantik with the HSCA Forensic Pathology Panel (and their radiological consultants) who had impressive credentials. So you are demanding that I take a hobbyist’s word over that of real experts. McAdams’ mantra of “impressive credentials,” is what is called an ‘Appeal to Authority’ in classic argumentation; a type of fallacy often used by those who cannot distinguish the truth on their own. Indeed. And as I once pointed out to him, there were many scientists with impressive credentials who half-a-century ago declared that there was no proof that smoking cigarettes caused cancer or heart disease. Also quite a few who stated that radiation from atmospheric testing of nuclear weapons posed little danger to the public. As late as 1970, I can remember seeing a Civil Defense film in a high school science class that stated as fact that nuclear fallout was harmless after just 3 weeks. You can get expert testimony in court cases from specialists with equally impressive credentials who contradict each other on every single point. Assuming one of these folks is blowing smoke to help a weak argument, you don’t even have to tell them you want them to fudge the facts. They know that in advance, and will simply figure out what you want and give it to you. I’m no fan of the MSM’s lack of attention to the pursuit of the truth in the JFK assassination. But I’d like to point out that some newspaper journalists in particular did some worthy work. The weekend it happened we had TV (mostly black and white), radio and newspapers. Initial reports were of frontal shot(s), people rushing up the knoll. Many leads were followed up but ignored by police. NOTE: WATCH the last few seconds (if nothing else). Future dallas Mayor Wes Wise as a reporter brought important information out, e.g. the Mather story. Former Dallas then in 63 national reporter Seth Kantor’s telling the Truth to the Warren omission and book are seminal in the history of assassination research. Some years later Fort Worth native and former Star Telegram reporter (and President of the Fort Worth Press Club) Jim Marrs would write a book called Crossfire, which became the movie JFK, which inspired the ARRB. I appreciate the work of these Journalist’s. Along with the work of so many since. In 1988, on the 25th anniversary of the assassination, one of NYC’s public TV stations (WNYC I think), ran every single minute of NBC’s assassination coverage, from the moment they broke into regular programming until 11 PM, EST. One thing I remember is that there were plenty of early mentions of shots being fired from the Grassy Knoll, and possibly other locations other than the TSBD, of both fewer and more than 3 shots, then suddenly all such talk ceased, with no explanation. I should point out that after just a few hours, it would have been impossible to reach a definitive conclusion as to the source of the gunfire, or how many shots there had been. One other thing I find very interesting is that just after Ruby had murdered Oswald, a number of clearly skeptical reporters were confronting some Dallas official or other about his claim that Ruby and Oswald had not known each other (and remember that these people had seen Ruby in the 2 days prior running around police headquarters as if he were a VIP). One reporter, his anger palpable, pointed out that someone had claimed to have seen Oswald at the Carousel Club. The official muttered something like it was mistaken identity, whereupon the reporter shot back something like “he does a memory act!” Clearly, a lot of these people sensed they were being lied to and were getting damned sick of it. And yet very shortly thereafter, almost all of them quietly shut up and swallowed the official line. Much as I admire the few who didn’t, I don’t see any reason to withhold scorn from these media figures and their performance. THEORY.” THIS IS THE FIRST OF TWO PARTS. FIRST, YOU ARE ENTITLED TO KNOW MY BIAS. JUNE 1967; THE SECOND IN NOVEMBER 1975. VICE PRESIDENT OF CBS NEWS, BILL SMALL. Oswald claimed he was a patsy then a few hours later he claimed to be totally ignorant of what was going on. At some point the laughing’s got to stop. I propose it’s at the point one realizes the Warren Commission consisted of seven members, three of whom were dissenters, one of whom was feeding information to the FBI (Ford), one of whom was a liar by profession (Dulles), one of whom was a close friend of the liar’s (Mcloy), and one of whom was bound and determined at the outset not to find a conspiracy (Warren). That’s no joke. That’s a national stain. Could you please give me that direct quote, Jonathan? “Q. Now, when this 10 by 17 centimeters of bone is missing, does that mean that it was present nowhere in the autopsy room during the autopsy? A. Not until later when part of it was brought to me, which I described, I believe, in the written report. A. The pieces that were brought to me, it was either two or three, I think three: one pretty sizable one and two smaller ones. Again, I’m talking off the top of my head. When they were repositioned to where they should have been, there was still a defect. We didn’t have sufficient bone to totally close the defect. Q. So then from the first time that you saw the President’s head without the pieces of skull fragment that came in later, the approximate measurements of the missing scalp would be roughly 10 centimeters to 17 centimeters? Jonathan’s note: 17 centimeters according to Boswell’s drawing necessarily means parts of the top of the head and the back of the head were blasted away. “Q. You mentioned that there was a rubber dam in the embalming process. Where was that located? A. Well, it was not in the embalming process. When they got finished embalming, we had to put–we didn’t have to, but we helped them put the scalp back together and the skull. And the defect that remained in the skull–I can’t now measure it specifically–was three or four or five centimeters, something like that. And we used a rubber dam to cover that part of the skull defect. Q. And where was that located? A. Well, I can’t–it was part of this large defect, and I can’t tell you now exactly where it was. Q. When you say part of this large defect, you mean in the parietal area? Jonathan’s note: The right parietal bone encloses part of the right top and part of the right rear of the brain. Humes elsewhere tells the ARRB (a) the cerebellum, which sits low in the back of the cranium, was disturbed, and (b) the scalp was lacerated into the occipital region. Taking Humes’s ARRB testimony at face value, one has no choice but to decide certain so-called autopsy photos are fakes. Humes also agreed that the photos appeared authentic. He certainly didn’t say the back of the head was blasted out. Of course Ryderberg himself later disavowed those drawings as totally inaccurate. 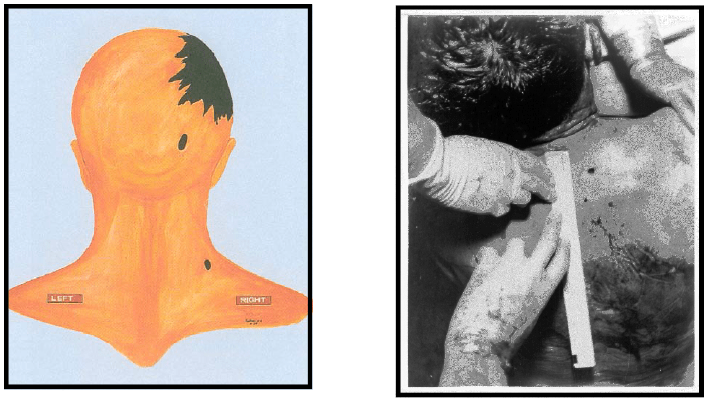 “When Rydberg’s drawing designated Commission Exhibit 386 is directly compared with an autopsy photograph an immediate discrepancy can be observed. I find that succinct point by point style exhilarating. It’s what’s needed more of. I mean there are so many points to be made it’s almost overwhelming, but just nail down a few just like you did really tends to drive the point right on through. It’s like we all should have about 5 – 10 solid irrefutable points to lay out there that even a child could see the illogic in the Warren Commission’s case. It certainly is a national stain. James Tagaue, in his book LBJ And The Kennedy Killing, , makes numerous references to what obviously was the goal of the WC: “We are here to close doors, not open new ones”. But we can’t really blame the WC for operating under that theme-Jedgar Hoover ordered them to do that. Disgraceful.Even after 50 years poor Oswald is still being accused of a crime he did not commit.Time for justice. This article from Salon.com is talking about the assassination of the archduke Ferdinand 100 years ago which touched off WW I.
It’s so easy now to look back on that and accept it for the conspiracy involving the Serbian intelligence services that it was. I wonder if 50 years from now we’ll clearly see JFK’s assassination for what it was. As you can see, there are a lot of questions today about his handling of the whole Tate/LaBianca case, which made his career. Aaron Stovitz, the original lead prosecutor, never bought the whole “Manson as mastermind” Helter Skelter scenario. And if you read this, you can see why. When he was running against for DA, Van De Kamp called him on his prosecutorial record. He was not able to back it up with documents. If you read RP, you will see that his win in London at that exceedingly ersatz mock trial, was really more about Spence’s lack of preparation, the records being classified, and the curtailed scenario of the trial, than anything else. If Spence had been properly prepared, with the declassified record, the case VInce presented would have been blown up piece by piece. As I do in the book. I guess they are showing this very poor show JFK show because Hanks produced it and he also produced the SIxties. More evidence of what a poor historian he is. I mean, in my book, I point out, for example, how can one do a mini series about WW 2 in Europe–which he did– and not even mention Operation Barbarossa? The German invasion of Russia. Incredible. What I find incredible is the false statements you made about NSAM 263 and the notation of John Newman’s book in the senior Air Force officer thread. More incredible is that when I posted evidence proving your statements to be false you disappeared. Is this what you call dealing with it? o They use the phone conversation with LBJ telling Russell how he convinced Warren to join the commission, but DON’T use the part where LBJ talks “about that little incident in Mexico City.” You know, the completely controversial, alleged phone call between Oswald and KGB wet operations agent Kostikov that could result in “40 million dead Americans in an hour.” The EFFING REASON LBJ HIMSELF GAVE FOR FORMING THE WC IN THE FIRST PLACE. o Numerous “experts” talk about how “thoroughly” the FBI and WC investigated the case, when we all know both entities were looking to shut speculation down on any conspiracy, foreign or domestic, as directed by LBJ. Please. o No mention of Joannides and the 50+ year felonious deception and obstruction of justice the CIA has pulled on the American people, with no repercussions or serious investigation by the media or the feds. WHICH COMPLETELY PUTS IN DOUBT THE CONCLUSIONS OF THE LONE ASSASSIN. PERIOD. So, in essence, CNN does a program about how the WR caused Americans to distrust their govt by serving up the same carefully edited pablum the WR served up in the first place. It’s simply amazing this shyte continues at this late date. You missed it, Bogman. It wasn’t even a CNN program. It was a Tom Hanks/Gary Goetzman production, created as an off-shoot of their 2013 documentary and feature films based upon Bugliosi’s book Reclaiming History. So of course it was biased. It was infected by the Bug! The FBI and CIA were also in complete CYA mode, meaning their investigative work was geared towards covering up any connection between themselves and Oswald. And I’m sure there were such connections. Read Michael Payne’s WC testimony. After looking at it myself I came to the conclusion that Payne and Oswald were both spying on groups like the ACLU and The John Birch Society, and probably a number of others, with Payne acting as LHO’s mentor. When a government agency commits a felony to misdirect Congress, it’s a sure bet there’s something huge to hide. At the very least, for me, that means the CIA was using Oswald for some intelligence purpose is a given. Whether they used Oswald in a conspiracy to kill the president, or someone hijacked the operation for that purpose, is a distinct possibility as well.